Thanks to the extraordinary generosity of the late Dr. Herbert J. Kayden of New York City and his daughter Joelle Kayden, Stanford MBA ’81, of Washington, D.C., the Cantor Arts Center at Stanford University now holds one of the largest collections in any museum of the work of Jacob Lawrence (1917–2000). Lawrence is among the most important artists of the 20th century and is a leading voice in the artistic portrayal of the African American experience. Staunch supporters of Stanford and the Cantor’s educational mission, the Kaydens have gifted to the museum an unparalleled collection of 56 works by Lawrence and one by his wife, Gwendolyn Knight Lawrence. The gift is comprised of five paintings, 11 drawings, 39 prints and one illustrated book, all dating between 1943 and 1998 and all given in memory of Dr. Gabrielle H. Reem, who is Herbert Kayden’s wife and Joelle Kayden’s mother. graphite on paper. Gift of Dr. Herbert J. Kayden and Family in memory of Dr. Gabrielle H.
With this addition to its collection, the Cantor is now positioned to be a leading resource for students and scholars to study both Lawrence and the social and political conditions of the historical era in which he produced this important work. While long-term academic and community engagement with the Kayden collection will unfold over many years, in immediate celebration of the gift, the museum is delighted to announce the first ever exhibition of these works together. Promised Land: Jacob Lawrence at the Cantor, A Gift from the Kayden Family both honors the Kayden family and marks a revelatory moment in the examination of this great American artist. Befitting the Kaydens’ entwined commitments to both art and education, the exhibition planning includes a course for undergraduate students at Stanford taught by Elizabeth Kathleen Mitchell, the Cantor’s Burton and Deedee McMurtry Curator of Prints, Drawings and Photographs. This intensive introduction to Lawrence’s career and key aspects of curatorial and art historical practices enabled 12 students to design the gallery layout and write exhibition texts. The resulting installation displays these works together for the first time. Promised Land charts the evolution of Lawrence’s distinctive and dynamic visual style over six decades. Lawrence’s work offers a sweeping panorama of the black experience in America that includes images of the struggle against slavery, the rise of Harlem as a center of black culture, the contributions African American builders made to the transformation of America’s cities in the first half of the 20th century and meditations on the artist’s creative journey. The works from the Kayden family gifts have never before been the subject of a focused exhibition, and the Cantor Arts Center is the exclusive venue for Promised Land. At Times It’s Hard to Get a Table in A Pool Room (1943). Jacob Lawrence, "And God said 'Let the Earth bring forth grass, trees, fruits, and herbs. '", Eight studies for The Book of Genesis, 1989-90, 8 silk-screen prints on Whatman Print Matt paper, Collection of Alitash Kebede, Los Angeles, CA. and an artist’s proof edition of Eight Studies for “The Book of Genesis” (1989–1990). 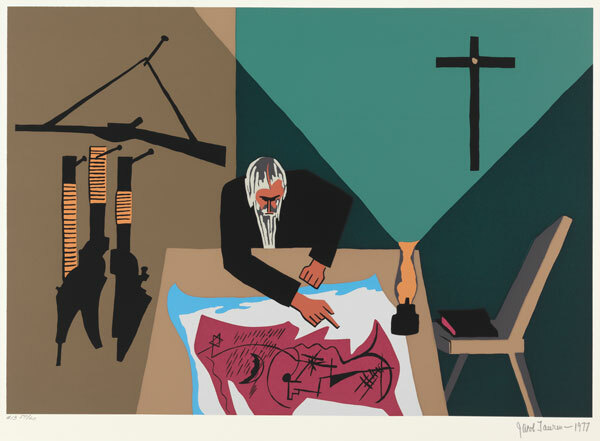 Consisting of twenty-two silk-screen prints, the portfolio is based on Lawrence’s same-size gouache paintings from 1941 (owned by the Detroit Institute of Arts) that explore the life of the controversial abolitionist. In 1977, when the paintings had become too fragile for public display and access, the Detroit museum commissioned Lawrence to reproduce them as limited-edition screen-prints. Each painting was originally displayed with the artist’s accompanying text, which builds on the powerful visual narrative. Lawrence’s John Brown series was among the historical epics he produced in the 1930s and 1940s focusing on heroic 19th-century figures like Harriet Tubman and Frederick Douglass as well as the Great Migration of the early 20th-century. “The Last Journey,” an illustration of Harriet Tubman’s heroic wagon journeys across the Canadian border. Lawrence, born in Atlantic City, New Jersey, in 1917, was active as an artist from his teen years until he died in Seattle, Washington, in 2000. 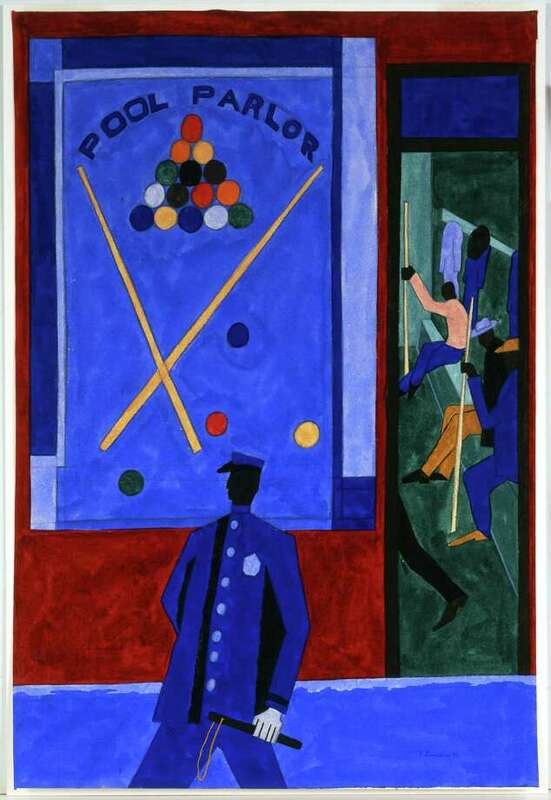 He arrived in Harlem in 1930 and became deeply integrated into its artistic community. He was then employed by the Works Progress Administration in the easel division and the Civilian Conservation Corps, and served in the Coast Guard on the first racially integrated ship in the history of the U.S. Navy. Lawrence referred to his work as “dynamic cubism,” with its bold colors and shapes. He was strongly impacted by artist and childhood mentor Charles Alston, artist Josef Albers of the Bauhaus and the artists of the Mexican muralist movement. His narrative paintings often reflect his personal experience or depict key moments in African American history, including the accomplishments of people such as Frederick Douglass and Harriet Tubman and the achievements of the American civil rights movement. Lawrence was the first African American artist to be represented by a major New York commercial gallery and the first visual artist to receive the Spingarn Medal, the NAACP’s highest honor.